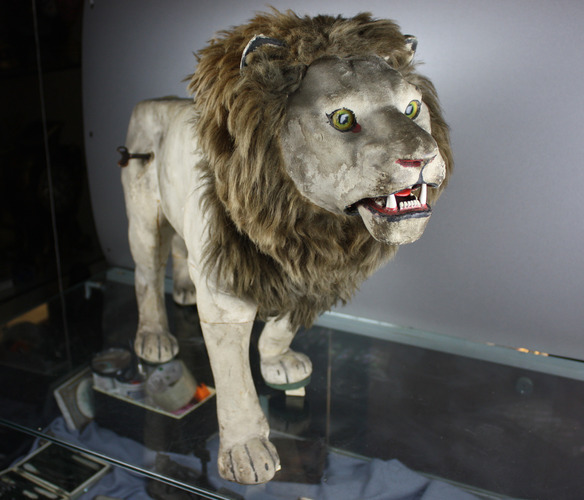 When wound by key to right haunch of back leg and the head tapped gently to start nodding motion, the jaw on counterweight opens and closes on the head adverse stroke, running for hours. Large four-pillar open-spring movement, with horizontal anchor escapement to direct push and pull through long connecting rod to the perfectly lead counterweighted head, having balance-affect to the separate jaw section which may be delayed by hand to close to either the down or up-stroke of the head. 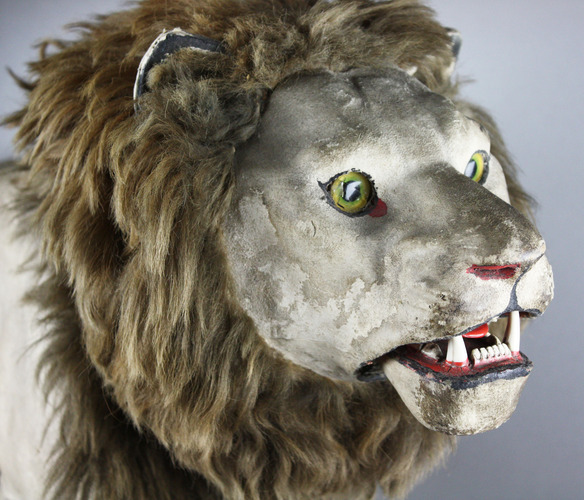 The lion in slow walking pose, full body of highly realistically moulded and contoured papier-mâché revealing to the eye muscle structure and ribs, covered with off-cream leather for finer texture and colour, tail trailing down between hind legs, terminating with a sprig of hair. Maine also of brown hair to conceal head rocking joint. Eyes of spectacular uranium-coloured glass with black pupils, jaw opening to show full set of teeth, with accurately depicted canines through to the molars, spring tongue in red, black lips and eye sockets and gums finished in red, paws and nose details picked out in black. 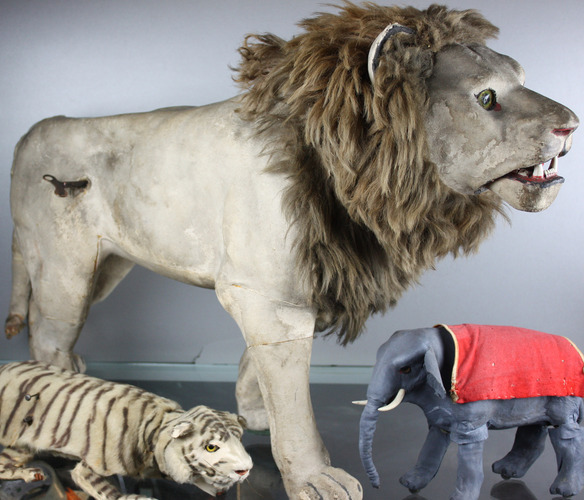 This is the real king of all antique animal automatons offered to date. This piece is absolutely enormous. 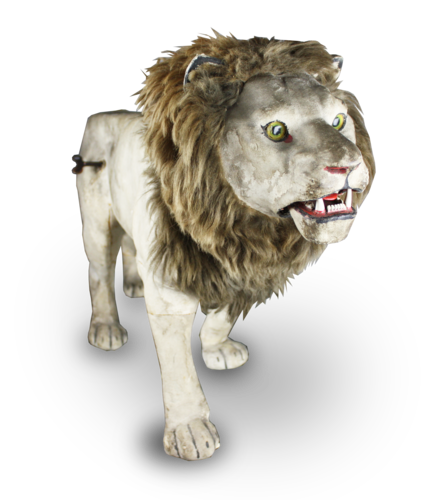 This incredible automaton is not to be confused with catalogue number 74 by Roullet & Decamps, of a lion which walks with turning head, as that is of the usual proportions - about 12 inches in length. 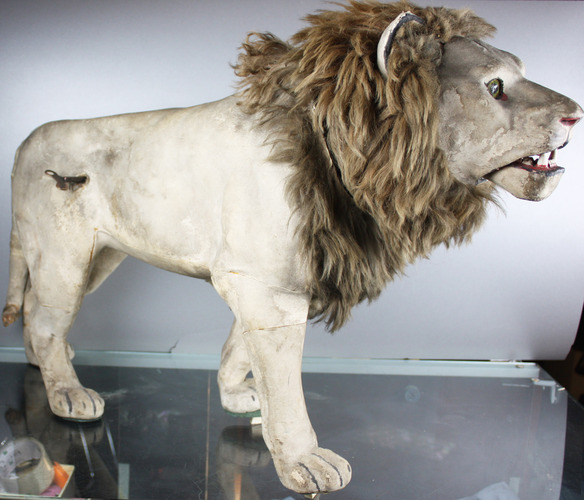 This monster of a lion would have been made for a public or other special exhibition display space. As such, this is one of the largest surviving automatons from the Golden Age period made by Roullet & Decamps. The nodding action is very simple; a movement with a pendulum escapement, although in this case, the pendulum is the head. Being counterbalanced, the large motor will last for a considerable time due to the lack of load it undertakes. If you seek a real head-turner for your collection, this King is certainly the correct choice for your Jungle.